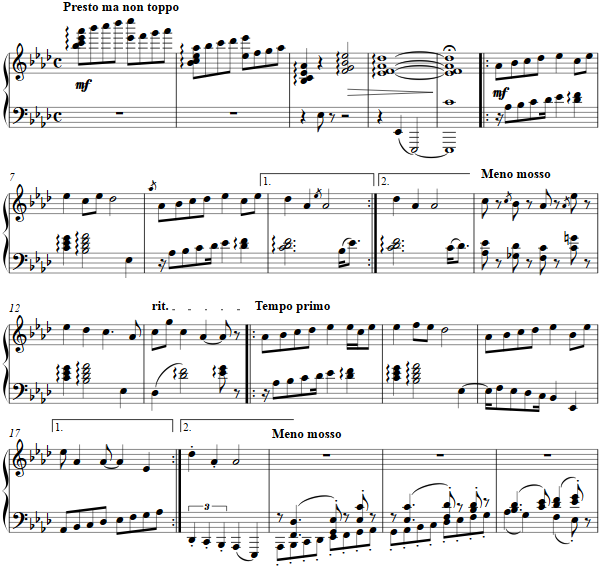 This "Chanson à accumulation" or cumulative song has refrain and chorus, the choruses lengthening as more details are added to the cumulative picture. The refrain in French: "L'arbre est dans ses feuilles, / Malurons, maluré / L'arbre est dans ses feuilles, / Malurons dondé." In English, "The tree is in full bloom, / Hoorah, hooray, / The tree is in full bloom, / Hoorah, dunday!" The choruses added together tell: "In the heart, there is love / The heart is in the bird / The bird is in the egg / The egg is in the nest / The nest is in the hole / The hole is in the knot / The knot is in the branch /The branch is in the tree." This piano study takes the refrain throughout as subject and toys with its repetitions in varying registers and domains. On "L'arbre est dans ses feuilles"